My trip began in Hong Kong, where I met my friend at the airport (she was flying in from Egypt, via Rome and Madrid due to a crap travel agent). It proved to be one of my favourite stops, even if it was a comparatively expensive one. I particularly liked the gorgeous Hong Kong cityscape, along with the thrill of being in the home of martial art films. 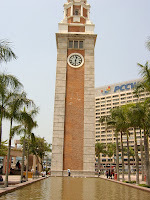 Standing under the Kowloon Railway Clock Tower from Jackie Chan’s ‘Project A’ was about the only film-related activity, though. My main chance for immersing myself in Golden Harvest kung fu grandeur, the Hong Kong Film Archive, proved rather less comprehensive than I'd hoped. In contrast to some of the places we went later, eating was basic. I relied on £1 chinese bread from the local supermarket, which appealed to my sweet tooth, as for some reason it's very sugary. Over the 6 days, there were three main activities of note. First up was our trip to Lantau Island, where you can find the largest bronze seated Budhha in the world, dating all the way back to…1993. Secondly was the ‘Kung Fu Corner’ in Kowloon Park. This proved to be not so much kung fu as huge portions of lion dancing. Still, some of the Lion Dances were relatively entertaining, when they either did something a bit more acrobatic or dramatic. For example, jumping around on benches, or when the 'Lion' took a while to 'wake up', which sounds kinda cheesy but I thought came off pretty well. In general, however, they get monotonous - jerky head motions whilst wandering around, throw a bit of cabbage from the mouth and that was about it. The dragon dance was more interesting, and a lot more sinuous (as you would expect from having about ten people holding the costume rather than just two), but I preferred the two dramatic and acrobatic Lion dances. Fortunately, they did do a few more conventional martial art demos amidst all the teeth and cabbage-leaf throwing. It looked like it was mainly southern styles, as there were lots of sweeping arm motions, blocks and swift, rigid strikes, with virtually no kicks. I recognised hung kuen, wing chun and some guys that had a praying mantis on their back. There was also a tai chi guy towards the end of the kung fu bit with a sword (hooray for swords!). More confusingly, there was a guy doing quite fast upper-body stuff, but with one arm behind his back the whole time. Not sure why. For an event that was supposedly designed for tourists, it wasn't all that tourist friendly. Proceedings were conducted entirely in Cantonese, so I understood two things - 'kung fu corner', and 'Wong Fei Hung'. I'm presuming the repeated mention of the latter meant some people were doing hung gar, but I'm not entirely sure. Anyway, it was nice to get some martial arts action in. Finally, we went to Repulse Bay, a relatively short bus ride from the centre (though it took us a while to work out which bus). This made for a pleasant break from the metropolis, and I even managed a bit of a tan due to the 37oC temperature. It was also a first outing for our ‘travel towels’, which are supposed to be quick drying and compact; for a change, they are.